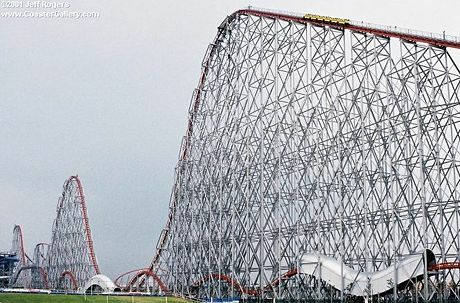 Steel Dragon 2000 roller coaster in Nagasaki, Japan, one of the tallest in the world. A Roller coaster is an amusement ride designed for amusement parks and modern theme parks. It consists of an elevated railway that carries a train through changes in speed and direction. At first glance, connected roller coaster cars look much like a passenger train. But unlike a train, it is not powered by a motor, but by gravity and momentum. To build up the ride's momentum it must first climb the first hill (or lift hill) by use of a lifting mechanism called a chain lift. The lift usually consists of one or more chains running under the track. The chain is fastened in a loop and wound around a motor-powered gear at both ends of the hill. The motor turns the chain loop, propelling the coaster train up the hill like a conveyor belt. The cars are attached to the chain by several hinged hooks called chain dogs. In recent designs, the use of catapult-launching techniques is sometimes implemented. After the coaster climbs the hill it travels down the first, and often sharpest, drop. The entertainment of the ride is provided by the velocity of the descent as well as features such as inverted loops, banked curves, and barrel rolls that produce g-forces that press down on riders. "Negative g-forces" give the rider a sense of weightlessness at the peak of hills. The earliest predecessors to the modern roller coaster were rides popular in Russia during the 15th century: steep, man-made hills covered in ice that were rode down on by sleds made of cut lumber and tree trunks. Riders climbed the stairs at the back of the slide and sped down a 50 degree drop. Much more elaborate than simply sledding, these sleds could reach speeds 50 miles (80 km) per hour and some hills reached as high as 70 feet. Some of these rides could reach hundreds of feet in length, but the ride down was usually quite brief. The Russian upper class found much entertainment in these ice slides and had some ornately decorated in order to be "fit for royalty". Catherine the Great has been said to have loved the thrills of the ice slides and even had several built on her property. The evolution of these ice slides into actual rolling carts can be traced back to 1804 when a ride called the Russian Mountains (Les Montagnes Russes) opened in Paris, France. The key modification that would shape the future of the modern roller coaster were the small wheels added to the sleds of the ride. Yet the first roller coaster where a train was actually locked to a track can be credited to the Russian Mountains of Belleville (Les Montagnes Russes de Belleville), which opened in Paris in 1817. Belleville's ride locked the cars by using the axles to slide into a groove in the track. This coaster also featured two separate tracks that ran side-by-side. This new design improved on it's predecessor by adding locking wheels, continuous tracks, and cables that lifted the cars to the top of the hill. A second roller coaster built in Paris by 1817 was the Aerial Walk (Promenades Aeriennes). This coaster had a heart-shaped layout that featured two tracks that ran in opposite directions from a central tower. After traveling around the course, the two tracks came together again at the bottom and then ascended two lift hills back to the top. The world's first looping roller coaster was located Frascati Gardens in Paris. 43 feet high with a 13-foot wide loop, the coaster underwent rigorous testing before anyone was allowed the ride on it. The coaster consisted of a gentle slope that riders rode down and through a small metal loop. This coaster was eventually imported from France to England. Thompson's Switchback Railway at Coney Island, New York. The first American roller coaster was built in the mountains of Pennsylvania. Called the Mauch Chunk Switchback Railway, the coaster resembled a runaway railway train more than an actual roller coaster. Starting as way to transport coal down the mountain in 1872, the railroad re-opened in 1837 as an amusement ride. The ride was a major success, carrying over 35,000 passengers a year. In 1874 it was bought by the Jersey Central railroad, but this did not halt the profitable journeys down the mountain. The area became a major Nineteenth Century tourist attraction and people traveled from all over the continent to ride the M.C.R. Despite it's popularity, the Depression reared it's ugly head and the Jersey Central closed down the ride in 1929 because of the decline in tourism. 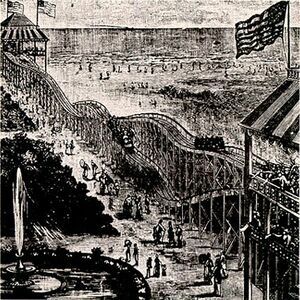 Thompson's roller coaster became a major success when the Switchback Railway at Coney Island, Brooklyn, New York in the spring of 1884. The ride became incredibly profitable for the inventor, making him hundreds of dollars each day by only charging a nickel per ride. Thompson became known the "Father of Gravity", a title he'd carry throughout the rest of history. More inventors followed in the footsteps of Thompson. In 1884 Charles Alcoke invented a complete-circuit coaster and in 1885 Phillip Hinkle developed the first lift hill, pulling the coaster cars up the first hill by a cable. This allowed for much higher structures, allowing coaster designers to become more imaginative in their designs, who incorporated an elliptical design into their coasters. Thompson stressed the view his rides gave just as much as the thrills. He created scenic railways that incorporated dioramas and the coaster descending into dark areas. Between 1884 and 1887, Thompson was given over 30 roller coaster-related patents , many of them scenic railways. James A. Griffiths of Philadelphia teamed up Thompson and together they designed the Scenic Railway that opened in Atlantic City in 1887. The ride featured the ornately-carved coaster cars and beautiful track layouts that Griffiths was known for. The two businessmen parted ways soon after and engaged in a bitter rivalry to open scenic railways. A major boom in roller coaster construction began in the 1920s, with an estimated 1,500 to 2,000 roller coasters operating during this period. Frederick Ingersoll helped spread the popularity of the amusement park by opening Luna Park in Pittsburgh that followed the format of Thompson. Another Luna Park opened in Cleveland and by the end of the decade there were amusement parks all over the country. Another man, John A. Miller, helped spread the popularity of the roller coaster. Miller had been given over one hundred coaster-related patents, including the anti-rollback device, the under friction wheels, and station brakes. His career began under the guidance of La Marcus Thompson. Miller also worked with other businessmen such as Josiah and Fred Pearce and Frederick Ingersoll. In 1920 he teamed up with Harry Baker before breaking up and starting his own business in 1923. He went on to design some of America's greatest coasters. 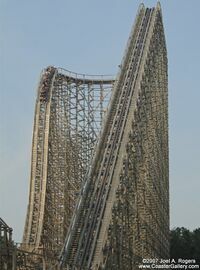 El Toro at Six Flags Great Adventure in New Jersey, one of the world's largest wooden coasters. There are two main types of roller coasters, mainly distinguished by their track structure, wooden roller coasters and steel roller coasters. Wooden roller coasters are coasters with tracks made out of wood and are made similar to traditional railroad tracks. Often the wheels of these types of coasters will have the same wheel design as that of a train, with the inner part of the wheel having a wide lip that keeps the train from rolling off the tracks. Another set of wheels keep the train from flying into the air. The tracks of these coasters are braced by diagonal support beams and wooden cross ties and the track structure itself rests on a lattice of wooden or sometimes steel beams. Unlike that of steel coasters, the track structure is for the most part inflexible, because of it's wooden material. This makes complex twists and turns difficult to implement. Instead most wooden roller coasters simply go up and down. Steel roller coasters, on the other hand, have a much more flexible design and can greatly expand the range of motion. Many of these types of coasters run on tubular steel tracks, introduced in the 1950s. These tracks consist of two long, steel tubes, supported by a lightweight structure composed of steel tubes. The wheels of coasters that run on these tracks are made out of polyurethane or nylon. Steel roller coasters provide the opportunity for much sharper and complex twists and turns as well as loops, barrel rolls, and other inversions not possible with wooden ones. Steel coasters are also known for their smooth ride, as opposed the rough one wooden coasters can give. Though many tubular steel coasters rest on top of the track, they may also attach to the bottom of the track in what is called a suspended roller coaster. These hanging trains swing from a pivoted joint, making the train move from side to side. An inverted roller coaster also uses this method, but has the train rigidly attached to the track to give more precise control over the trains movement. Pipeline - where riders are positioned between the rails as opposed to above or below. Bobsled - where riders ride freely through a trough, like a bobsled run. Flying - where riders are positioned parallel with the track, giving them a sense of flying. Fourth Dimension - where cars, positioned on either side of the track, spin on a horizontal axis. This page was last modified 14:21, 25 March 2010.